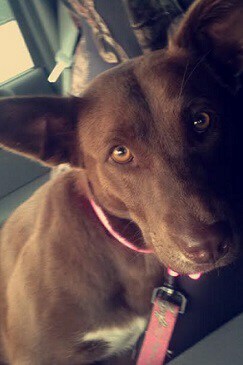 This gorgeous girl Jersey is a 15 month old lab X that came to New Hope Dog Rescue Jan 28th 2015 from a Canine Action Project clinic (http://canineactionproject.com/). It was noticed that she was lame on her right hind leg and her toenails were growing into her pad. Unfortunately even after her toenails were trimmed, her lameness continued. Jersey has an old injury to 2 of her toes (possibly a trapping injury) so that she cannot bear weight on her right hind foot. To fix this Jersey will need surgery to straighten her toes. After her surgery she will need rehabilitation, to help her walk normally again! Jersey is such a lovely tempermented dog and doing so well in foster care!! Jersey has her surgery April 8, 2015 and she is recovering well! She still tends to use only her 3 feet, but her surgery site is nearly healed and she allows her foot to be touched and maneuvered without pain. We are hopeful that with a few more weeks of recovery, she will begin using the foot freely once she realizes there is no pain. Update (June 1, 2015): Jersey is using her foot more and more! It won’t take long for her to be running around just like any other dog. Better news yet! 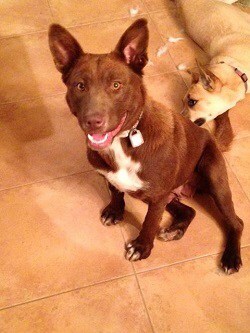 Jersey is being adopted by her foster parents! If you would like to make sure that NHDR can help dogs just like Jersey, please donate to help cover the cost of Jersey’s care!